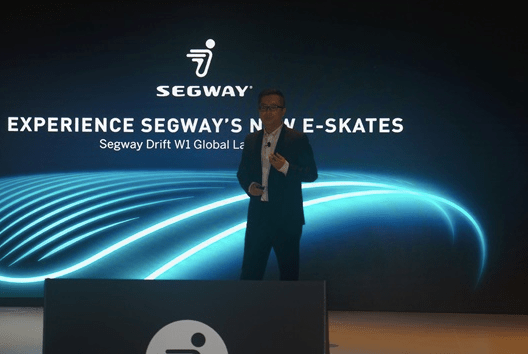 Segway-Ninebot Inc. hosted a truly informative press conference on July 24th to officially announce the launching of their new product series, the Segway Drift W1 E-Skates and the Ninebot Gokart kit at the swanky Westin Bonaventure Hotel in super hip downtown Los Angeles. Segway thinks this product has the future potential to dominate the short distance traveling transportation market by resurrecting the street culture and I totally agree. It’s a product that is cooler than skateboards and possess the technology that made Hoverboards look like a trend from yesteryear. The announcement covered all the aspects of the product in-depth such as functionality, distribution, marketing, price, and following timelines. Another product that was launched that day was the Ninebot Gokart Kit, which is a unique accessory for the miniPRO260 or miniPRO320. Users attach their miniPRO to the kit, acting as the rear wheels and drivetrain for the Gokart. This kit offers three driving modes; novice, normal and sports, with each corresponding to a different driving speed. The Ninebot Gokart Kit has a top speed of 15 MPH, a typical range of 9 miles and a maximum payload of 220 lbs. It can be adjusted to lengths between 51 and 75 inches, suiting the needs of most riders. In keeping with Segway’s overall focus on safety, it offers dual braking (electronic and mechanical), as well as speed management and alerts via the mobile app. With a strong battery, simple operation, and suitability for a wide range of people. You can reserve your Ninebot Gokart Kit at Segway.com When released, the kit will have an MSRP of $599. 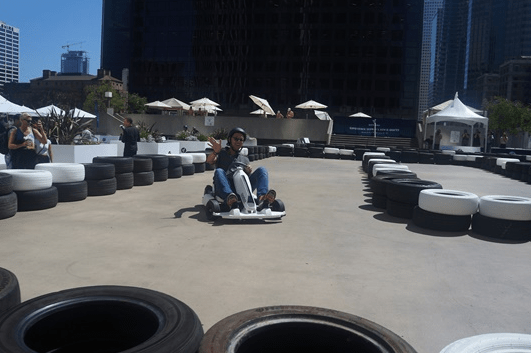 An attendee has a blast on the Ninebot Gokart Kit! 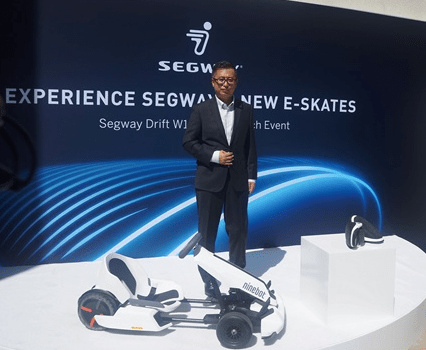 During the event, besides announcing and introducing the product, there also was an E-Skates racing tournament which consisted of influencers and other media testing out the products. During the press conference, the entire panel consisted with key members of the Segway-Ninebot leadership including the CEO. Many of members on the panel are from the international capital giant Ninebot Inc. who have flown from Asia and other continents. They spoke about the trend of globalization and how the international capital and management style is merging and effecting the American organization’s culture and business development via the Segway Inc. and Ninebot Inc. merging.